A classic 2D side-scrolling action (Metroidvania) game. The young priestess embarks on a journey to solve the monsters' suspicious movements in Parthenope. Seek the help of your peers and elves, Acquire a variety of abilities, and reach the end to discover the truth. *Fixed the bug the difficulty doesn't affect Star Dust. *Fixed Silver coin error when purchasing items in the shop. Hey there, it's qwerty here from 魔术工坊. I think I can still call myself a student of a sort. I just want to say thank you for noticing my game and it's my first time making games for someone I don't know in person. No matter who you are, where you are, I hope you'll enjoy. If you have any question, please leave a comment anywhere, I'll check. This game is kinda a homage for Momodora: Reverie Under the Moonlight, or a rather awkward one. But there will never be Successor of the Moon if there's no Momodora. "People will keep telling her story, believing in her spirits, and all of this will lead young priests to peace". As a media, game can certainly convey some of my feeling like nothing else can. Something may seem like it worth nothing, but it may guild later comers like the stars in the sky. Due to lack of fund and other conditions, the first step was kinda hard to make. And, with oppertunities in the future, I hope to continue to write this story. After all, the true MC, Verginia, her story has just began. 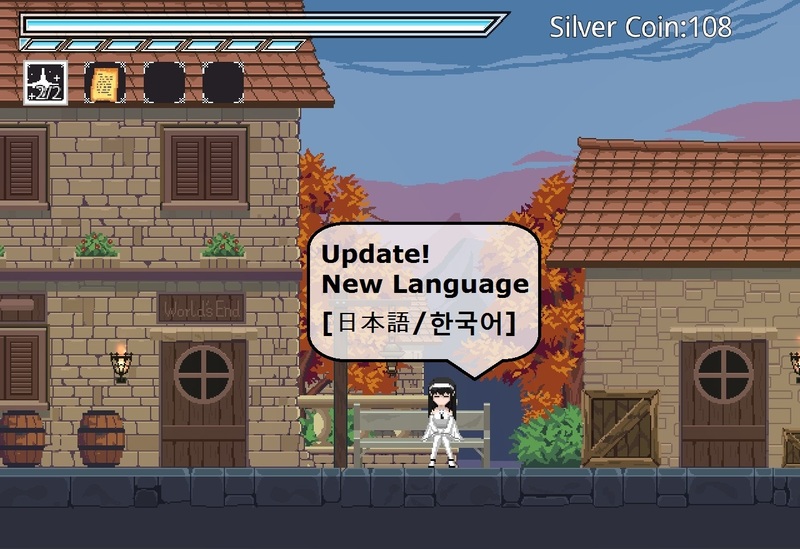 *Optimized English translation and added Japanese and Korean support. *Optimized the display of the mini map. *Fixed the bug that may cause savedate corrupt. *Fixed the left and right arrow key unresponsive problem in the main title. *Added slots for more savadata. *Remove the auto deletion of savadata after finishing the game. * Remove the after action of the throwable. *You can now enlarge the window x2. *Esc is now the hotkey for minimap, of course you can change it to the way you want. *Fixed landscape error in the snowplane. *Reduced the DoT of poison. *Reduced the total health of bosses. *Increased the power of springs. *Fixed some display errors. About the bug that causes you not being able to enter the game: It's just me who's developing this game snd though I've already stayed up for nights trying to figure out what's wrong, I can only find a partially solution to the problem. Some can't open because of a few Intel graphics card doesn't support opengl. Updating the drive will help. I'm still trying to find a solution for everyone. Please stay tuned and have faith in me. Thanks all of you for your reviews, comments and emails. 'Successor of the Moon' is a 2D side-scrolling action (Metroidvania) game. After receiving reports about monsters' suspicious movements in Parthenope, the young priestess Stella embarks on a journey to resolve them. Seek the help of peers and elves. Find out the truth about Stella's journey.